Cork grease, mouthpiece brush, swab, neck cleaner, polishing cloth, duster brush, key oil and ID tag. A good rule of thumb is to clean your sax whenever you need to replace a reed. Always pick the instrument up by the bell, never by the keys. They keys should not be touched until the neck strap is attached and you are ready to play. Only the instrument should be stored in the case. Storing music, metronomes, books, etc. in the case can cause bent keys. If the instrument is not being played, it belongs on a saxophone stand or in its case. Always use the end plug when storing the instrument in its case. This will protect the octave key from damage. Performers should NEVER eat or drink anything while playing (except water, of course). Many people also rinse their mouths with water immediately before playing. These are excellent preventative measures, which can keep those scary UFO¡¯s (Unidentified Food Objects) away. After you play, dry out the mouthpiece. Use a fuzzy swab, or a handkerchief. Wipe the outside of the saxophone with a soft cloth, so that any little bits of saliva that may have landed on it are not left on the lacquer. Shake as much water as possible out of the saxophone neck before putting it away (holding it by the bell). Don't put it away wet; that will promote mold and maybe rust. Swab the neck. Use the brush attachment (looks like a flexible metal hose with a rag ball on one end, and a small brush on the other) and pass it through the larger, base opening on the neck, coming out on the narrow side to which the cork is attached. Brush out the inside to remove any foreign particles or bacterial growth, and use the swab last. Gently pull the brush attachment through the body as well, repeating this process several times. If possible, hold the keys down as you do this. It is not unusual to see a slight green color on the pad after a few passes. This is corrosion on the inside of the saxophone, as brass rusts green due to the copper. You can run water through the neck as well, just be sure that no water comes in contact with the cork, or it will swell and deform. Be wary of the pad on the octave valve as well. Clean your mouthpiece. To clean the mouthpiece, firstly remove the reed and ligature. Then use a mouthpiece cleaning brush or an old toothbrush and warm (not hot) water to remove any foreign material inside. If the water is too hot, you can warp the plastic. Run warm water through the mouthpiece at the sink. Using a clean, lint-free cloth, pull it through the mouthpiece to dry and remove any particles missed by the brush. Never use liquid polishes on the body of the instrument. Wiping down the instrument with a flannel cloth will remove saliva and grease, helping to preserve the finish. Use a Q-tip to clean between the keys. Chipped mouthpieces should be replaced. Check & clean the valve pads. There are many on the saxophone, so this may be the most time consuming step. Visually inspect each pad, looking for wear or tears. If a pad is torn, take it to your local repair shop for replacement. Using a piece of paper or a pad cleaner, slide the paper underneath the pad, close the valve, and slowly pull the paper out. This helps remove foreign material from the pad. Tighten loose screws. Most screws on a saxophone are of the flat head. You can tighten loose rod screws safely, but do not over-torque them. If this happens, you may not be able to press keys such as those necessary for a high-D or F#. Swab and grease the corks. Dry the cork on the neck completely, and add a liberal amount of cork grease. Lubricating the neck cork with cork grease allows the mouthpiece to fit easily. Rub the grease into the cork to 'condition' it, and add another light coating. Do this weekly, and you'll maintain an impressive seal. After some time of doing this, the cork will get saturated with grease; do not grease further, or you will hasten the deterioration of the cork. Don't try to grease the little bits of cork on the ends of actions; they're there for padding. 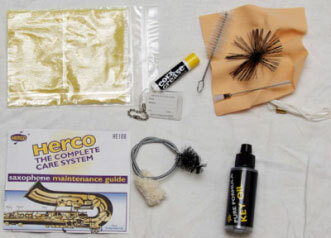 Do not attempt to oil, remove dents, replace pads, or use scratch-removers on the finish of your saxophone. Leave these things to a professional. The outside of the saxophone is made of brass; an alloy of zinc. Brass, like anything else, can accumulate dirt and grease deposits, and over time it may also tarnish. Do not use any sort of abrasive cleaning techniques on brass-plated pieces, because the plating is likely quite thin and you could easily wear through it. Wipe the brass off with a soft, dry cloth as needed. Keep your hands off brass. Oils and dirt from your fingers immediately mar the surface of brass and, in the long run, contribute to tarnishing. Handle brass with a soft dry cloth whenever possible. A minimum of a yearly service/repair shop visit is a must.